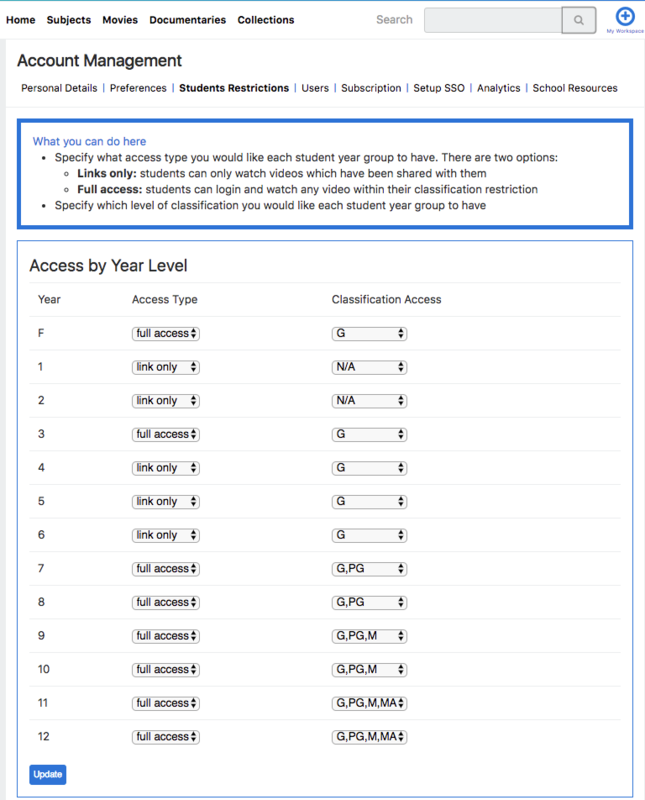 Student restrictions is the section of the site that will allow you to set classification restrictions for your students for each Year Level. Please note you have to set Student Restrictions before you add students to the system. To access Student Restrictions, click on Manage account. Full access will give access to all content under your selected classification. N/A will allow no access to the selected year level. Link Only will only allow the selected year level to view content a teacher or admin allows them to view. Once your students are connected to EnhanceTV, they will be able to receive a unique link from their teachers to watch content selected by a teacher only. Selecting N/A in the classifications or when a student goes to watch a video with a higher classification than their access will show the below message.